With his name being floated around in trade rumours for years, it’s not surprising that the Montreal Canadiens traded Alex Galchenyuk. 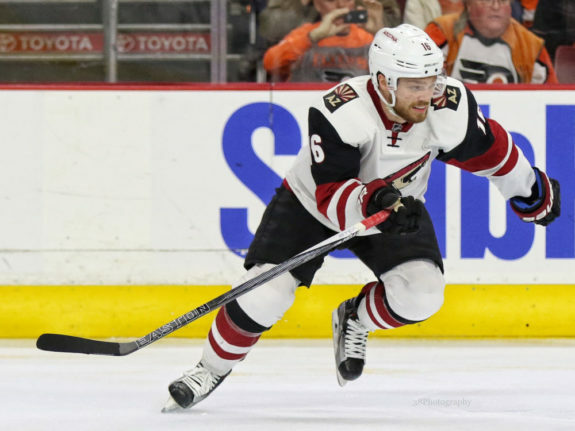 It’s the return that was the shocking part, as Max Domi from the Arizona Coyotes came back the other way. This is general manager Marc Bergevin’s third straight one-for-one summer blockbuster deal and he has taken a lot of heat for them. And, with the way things have gone in Montreal, this is another Bergevin trade that will be talked about for a long time. Galchenyuk and Domi are primarily known for their offensive talents. Both have produced a near identical points per game average of .61. However, that’s where the comparisons end. In six NHL seasons, Galchenyuk has played 418 games with 108 goals and 255 points. In three NHL seasons for Domi, he has played 222 games with 36 goals and 135 points. Stylistically, Galchenyuk is more of a goal scorer, while Domi’s strength is playmaking. The last two seasons have been telling for both players. Galchenyuk has 36 goals scored the last two seasons while Domi has just 18. Since scoring 18 in his rookie year, Domi’s goal scoring has gone off a cliff, averaging just nine the last two years. Domi beats Galchenyuk in the assists category, though, with 65 the last two seasons combined, compared to Galchenyuk’s 59 in the same span. Their overall point totals aren’t astronomically different with Galchenyuk having 44 and 51 points in the last two years and Domi having 38 and 45. Offensively, Galchenyuk is the more accomplished one at this point, but Domi has the talent to close that gap. Galchenyuk’s development in Montreal was a question from day one, with the lack of a consistent role and the general feeling he wasn’t meeting management’s expectations of him. He has yet to string together a truly consistent season, as stretches of brilliance would be sandwiched in between bouts of inconsistency. For Domi, his rookie year was promising with 52 points in 81 games, but has regressed offensively since then. Domi has the skill to turn things around and plays a feisty game that fits into what the Habs are going for. Perhaps for both players, they will realize their potential with their new teams. Galchenyuk could thrive playing in a smaller market with a consistent role (perhaps at centre again) and good ice time. Domi could find his game playing in the bright lights of Montreal and playing for Claude Julien, who has coached similar players in Brad Marchand and Brendan Gallagher and helped them reach their potential. He excelled for Team Canada when the World Juniors in Montreal and Toronto and thrived playing for the powerhouse London Knights, one of the biggest markets in the CHL. 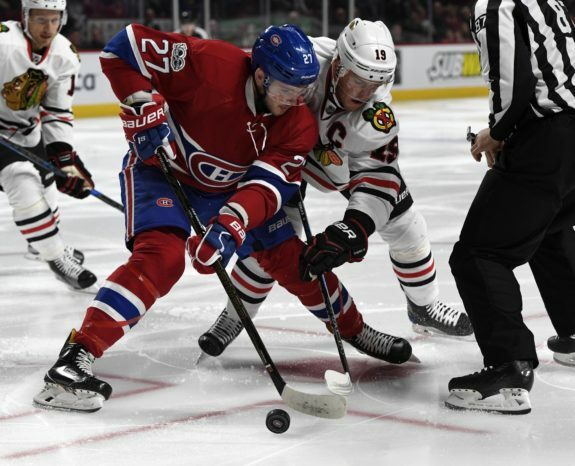 For the Habs, it’s another one-for-one deal where they didn’t address any needs. Domi is primarily a left winger who has had small stints at centre. The Habs lack depth at most positions, but at the NHL level, left wing is where they are pretty well stocked. In this deal, the Habs didn’t receive a good legitimate NHL centre or a top four defenceman, especially one that can play on the left side. The idea of the Habs potentially playing Domi at centre instead of keeping and trying Galchenyuk there is very reminiscent of them acquiring a left winger in Jonathan Drouin last year, and turning him into centre to fill the need. The Habs didn’t do a lot to raise Galchenyuk’s trade value, so for Domi to be the only return in the deal prompts a lot of questions. Was this really the best possible return for Galchenyuk or were there other factors at play? The 2017-18 season was a disaster for Montreal, and Bergevin is being given another chance by ownership to get things back on track. This move just creates more questions than answers as the Habs traded away the better player in the deal and didn’t address any of their current needs in the process. As of right now, the trade is in the Coyotes’ favour, with Galchenyuk being the more accomplished and established player. Domi’s regression the last two seasons is concerning, but the hope is he’ll re-discover his game again and be invigorated playing in Montreal. It’s clear Bergevin was ready to move on from Galchenyuk by moving him when his trade value was low. Both players have had their struggles playing in the NHL, but trading a player who has shown to be capable of scoring 30 goals in exchange for a player who has scored a combined 18 the last two seasons makes this a controversial deal that will keep Bergevin on the hot seat.